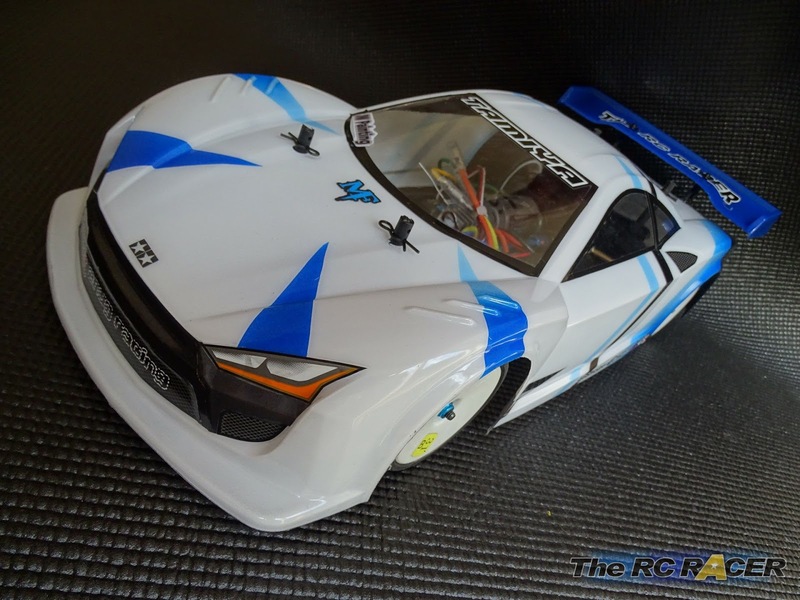 The Raikiri has been a Tamiya shell that I have been really excited about trying once it was announced. It has been designed by car designer Kota Nezu of Znug design. The Raikiri is a legendary sword that appears in Japanese mythology, and provides the creative inspiration for his design. 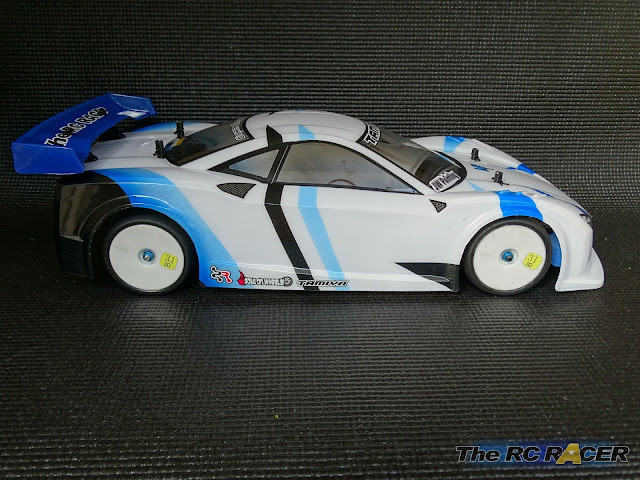 More importantly, it has a resemblance to the Tamiya NSX 2003 shell which was one of the best lids to pop on your Tamiya Chassis in the Tamiya Cup; so good in-fact that they were banned! So will this shell be a game changer on the track? 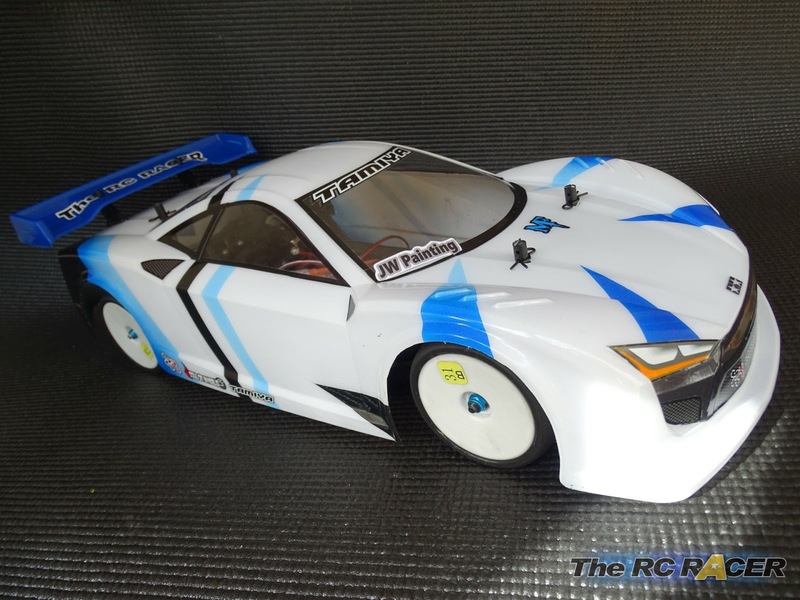 I had the ideal opportunity to test the shell as we are running a stock Tamiya TT class at my local club. It only allows Tamiya shells so I was keen to see if this would be as good as some of my friends in Japan are saying, so I promptly ordered one. 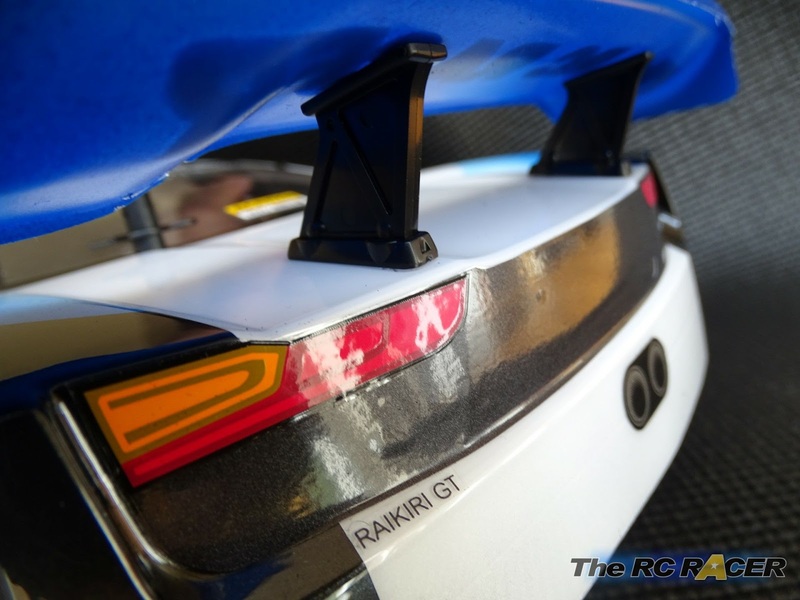 The bodyset contains the main shell, a rear wing and it's plastic mounts along with a set of decals, window masks and body clips. 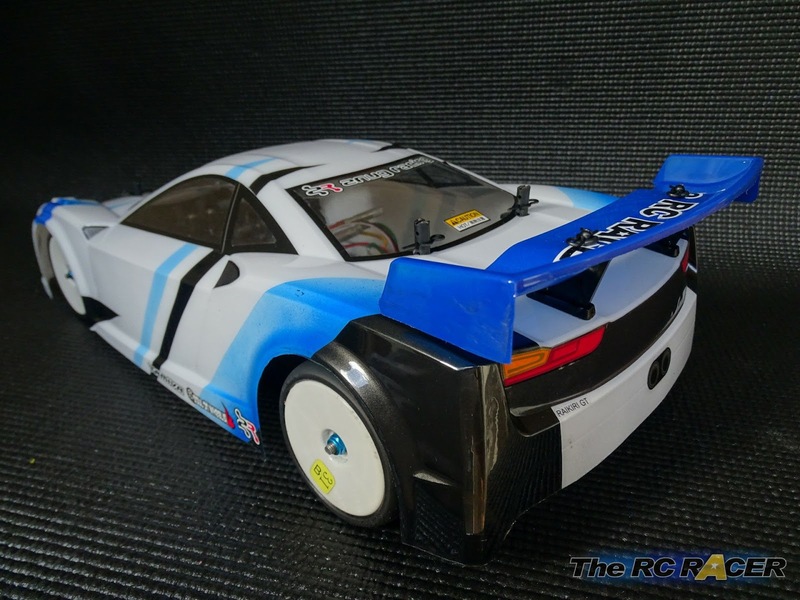 The shell is typical Tamiya quality, made with strong high quality lexan and the moulding is perfect with nice detail. Once I received the shell back from JWpainting it was trimmed and the wing was mounted. The wing is mounted on two supports that allow you change the angle of attack for the wing. These mounts have been used on many Tamiya cars, and you can even buy hop-up aluminium parts that give you more angles for the wing.. although they are heavier. The final painted and assembled shell weighs in at 114g. 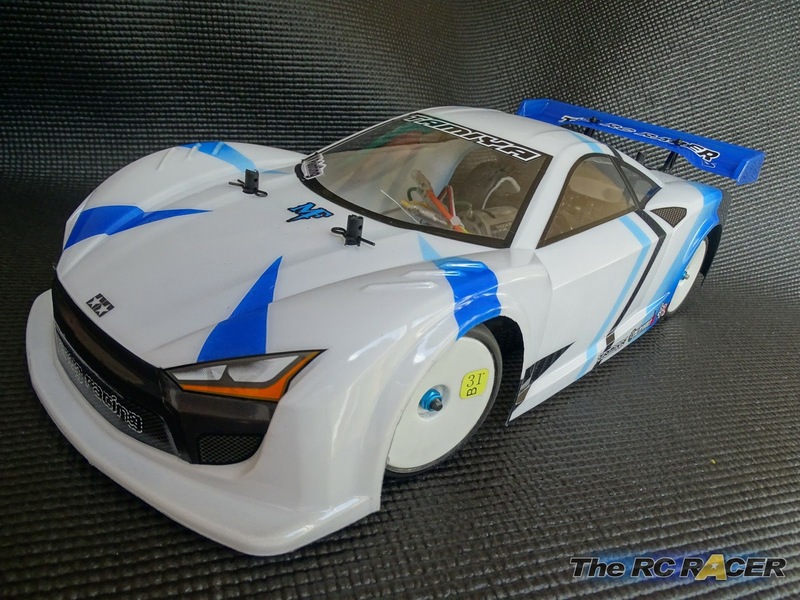 It will get heavier if you want to slap loads of decals on, but with the lights / grill you only add 7 g more weight. Fitting the shell is simple as it has dimples where you can ream out the holes for the body posts. There is one pair at the rear and two at the front, so depending if your Tamiya TT 01/02 TB 03/04 or TA05/06/07 chassis has the front posts on the towers or in the front bumper mount you will find that it's easy to fit. The shell looks fantastic. It is made for 190mm racing so if you run 0 offset wheels with the shell on a TT02 (I have Sorex 32's on this) the wheels do hide a little bit in the wheel arches, although nothing to freaky looking. 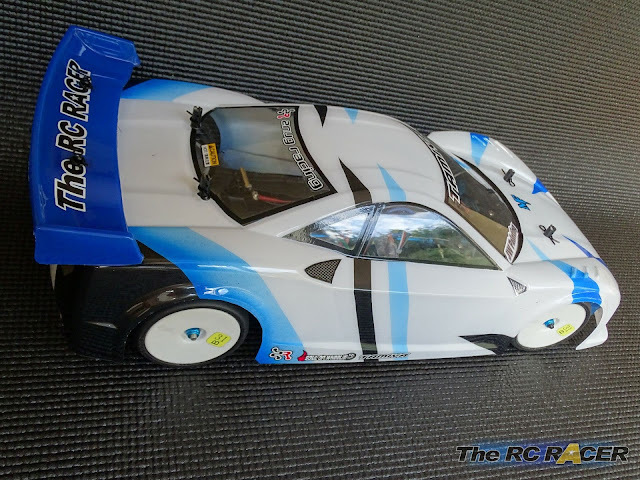 I was keen to fit the shell on the stock TT02 and see how it performed on the local carpet track. The TT02 was only running a Torque tuned motor (That's the spec motor for our class) but I had fitted the speed tuned gear set so it could reach a good enough speed to test the aero. It didn't take long to realise that the shell felt very neutral and the TT02 was easy to drive around the tight and twisty track. The low front end provided enough initial steering to ensure I could attack the corners whilst still on throttle. The car did wash out a little as it approached the apex, but that is probably because the rear end was also very planted. The car was almost boring to drive as it felt so stable. 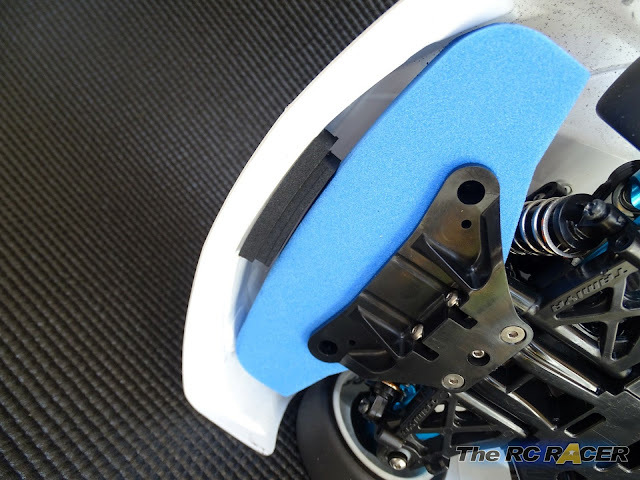 I stuck on some foam toe ensure that it would not flex on impact, reducing the chance of splitting the lexan. 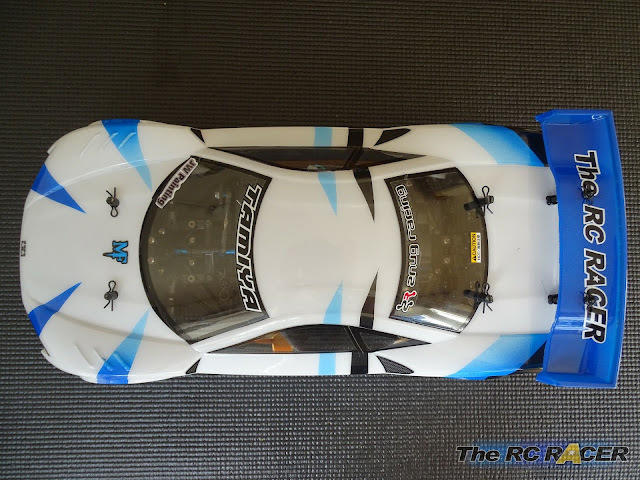 For the second race I changed the rear spoiler angle by swapping around the plastic mounting spacer that is included with the body, this did free up the car a little and it felt better at the apex and I found that applying the throttle quite aggressively would help the car rotate on the way out. This decreased the lap time marginally and the back end was still calm and very easy to keep in check. I am happy with this shell. The TT02 was easy to get around out tight indoor track and if anything the extra grip from this shell might be a little bit too much for my liking. I personally love the styling as even though it's a fictional car it has the style and look of a mid engine race car, and it looks great when you add your own racing livery to it. I think this is going to be a favourite for those racers who need to have a Tamiya shell to compete, and I expect to see it becoming very popular for that class.